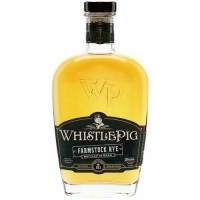 FarmStock is a historic step in realizing our vision of creating a true farm-to-bottle whiskey. It is the manifestation of the dream that launched the company: to produce the finest whiskey in the world from our Vermont farm. Crop 001 marries the untamed contours and boldness of our estate whiskey, which only youth can provide, with the richness of our best five to six year ryes, topped off with the splendor of our 12 Year whiskey. Flavor: Caramel, cinnamon, and baking spices prevail with hints of citrus and stonefruit.